USATF Officials Monthly Newsletter Is this email not displaying correctly? The USATF Board of Directors approved an emergency amendment of Rule 180.12(e), changing the time limit to initiate an attempt in a field events from 30 seconds back to 60 seconds. This amendment takes effect as of April 8, 2019. This action was based on a request from the Rules Committee so that USATF rules to be consistent with the recent change made by the IAAF Council to IAAF Rule 180.17, returning to the 1 minute time limit for field events. Given that both the USATF Championship and U20 Championship qualify athletes for competitions contested under IAAF rules, a request was made for an immediate change to the USATF rules. This past weekend, the USATF Board of Directors approved this request, with immediate effect, for all USATF sanctioned competitions. I have just been made aware that the USATF Outerwear Store, Boathouse, has reopened their digital doors until May 6. If you are in need of the official outerwear gear such as jackets or rain gear, please click the link below. You will need your certification number to complete your order. If you have an item you would like included in the newsletter, please send your submissions to NOCnewsletters@gmail.com. The submission deadline is the 25th of each month in order to be included in the subsequent issue. We will accept announcements, articles and other news-type items that are national in scope. Local announcements and opinion pieces will not be included. Please be aware that all submissions are subject to approval by the N.O.C. Executive Committee. If you are the official’s coordinator for a national championship or major regional meet and would like to have it listed on our calendar, please visit our new Applications page (http://www.usatf.org/Resources-for---/-groups-officials-/Applications.aspx) and submit it. All applications are subject to review before posting. Copyright © 2019 USATF Officials Committee, All rights reserved. 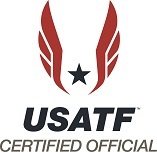 You are receiving this email because you are a current or past USATF Certified Official and previously signed up for our newsletter or other email updates.